Encyonopsis aequaliformis should be considered for transfer to the genus Kurtkrammeria. Valves are weakly dorsiventral, lanceolate to elliptic-lanceolate with capitate apices deflected slightly to the ventral side. Valve shoulders are lacking. In smaller valves there is slight asymmetry on either side of the transapical axis, giving valves a somewhat gomphonemoid appearance. The axial area is narrow. The central area is small, formed by the two opposing shorter and more widely spaced central striae. The raphe is lateral with weakly inflated proximal ends that are deflected toward the dorsal margin. Distal raphe ends are hooked toward the ventral margin. Striae are radiate except at the valve center and near the apices, where they are parallel. Areolae are very fine and difficult to resolve in LM. Encyonopsis aequaliformis has been collected from a pond and a small lake on Adak Island, Alaska (Hein 1990) and from three lakes in western Washington (Bahls 2013). 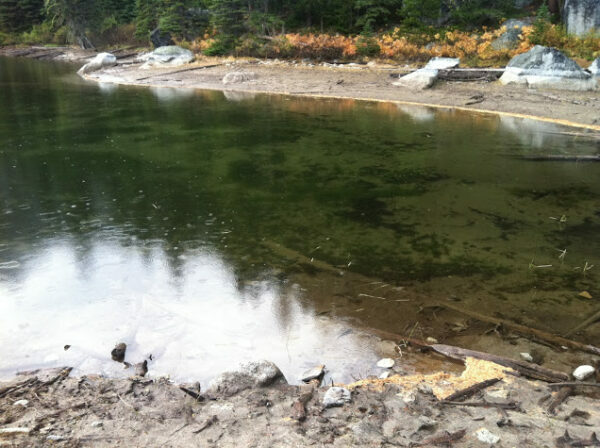 Nada Lake, Chelan County, Washington: type locality of Encyonopsis aequaliformis. Valves lanceolate to elliptic-lanceolate, not or slightly dorsiventral. Apices distinctly capitate. Valve length 25–32 μm; valve width 5.9–7.0 μm. Axial area narrow. Central area small, defined by a shortened median stria on each side. Raphe weakly lateral and nearly straight, close to the valve midline. Proximal raphe ends slightly dilated and bent toward the dorsal side. Distal raphe fissures hooked toward the ventral side. Striae moderately radiate, parallel to weakly convergent near the apices, 12–15 in 10 μm at valve center, 16–19 in 10 μm near the apices. 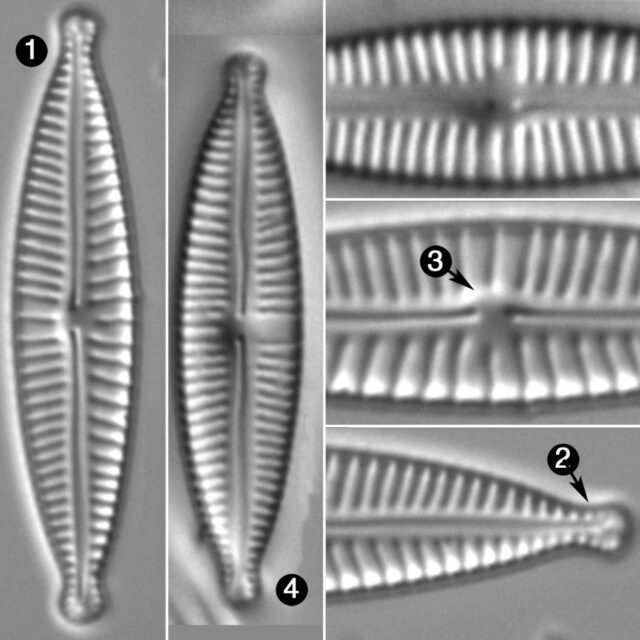 Hein, M. (1990) Flora of Adak Island, Alaska: Bacillariophyceae (Diatoms) Bibliotheca Diatomologica (H. Lange-Bertalot, ed. ), Band 21, J. Cramer, Berlin, 133 pp.+ 53 plates. 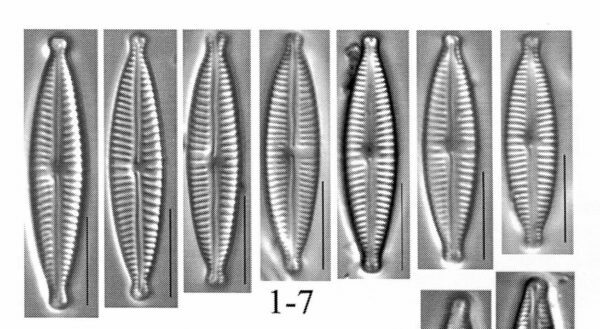 Encyonopsis aequaliformis has lanceolate to elliptic-lanceolate valves, with capitate apices. Valves are greater than 20 µm in length. The central area is small and somewhat variable within a population.